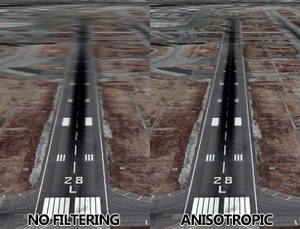 Example of anisotropic filtering on a runway. Notice a reduced blur with Anisotropic filtering. Anisotropic filtering is a type of texture filtering which increases the visual quality of textures at steep angles to the camera, such as those that recede into the distance. The option to enable anisotropic filtering is present in almost every PC game on the market today. Usually you will be able to select texture sample rates of 2x, 4x, 8x, or 16x. The texture sample rate is the number of passes the anisotropic filtering algorithm makes on the current textures in the frame. Most newer GPUs can render settings of 8x or 16x AF without a noticeable loss of performance, but if you are experiencing low FPS, lowering the sample rate or disabling the anisotropic filtering setting may increase performance. Due to how linear texture filtering works, the need for anisotropic filtering is reduced as the rendering resolution is increased. Despite this, it is still recommended to enable the maximum viable anisotropic filtering setting due to the noticeable improvement in texture clarity. For a list of games, see games with anisotropic filtering (AF) support. Most modern 3D games provides native AF. It can be configured through its Graphics settings, console commands, launcher options, or configuration files. only supports up to "Trilinear Filtering"
Open the NVIDIA Control Panel found in in Windows' Control Panel. Proceed to the 3D Settings / Manage 3D Settings tab on the left side bar. Select the game under 'Program to customize'. Alternatively, manually select the executable using the 'Add' button. Change the 'Anisotropic Filtering' option to the desired level of sharpness. Open the AMD Catalyst Control Panel found in Windows' Control Panel. Proceed to the Image Quality / Anisotropic Filtering tab. Uncheck the 'Use application settings' box. Set the option to the desired level of sharpness. Open the Intel Graphics Settings found in in Windows' Control Panel. Proceed to the 3D Settings icon. Under "Select Application", click "Browse", and manually select the game executable. This page was last edited on 13 February 2019, at 04:09.